Geogrids - Titan Environmental Containment Ltd. Produced at ISO 9001 certified manufacturing facilities Titan TE Geogrids consistently meet demanding QA/QC requirements and are continuously tested to rigorous ASTM standards both in-house and by leading independent geosynthetics laboratories in North America. 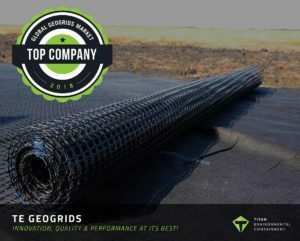 In addition to excelling in product evaluations in all performance parameters, all Titan geogrids are CE-certificate ensuring our ongoing compliance with globally recognized standards for health and safety, production control and quality management. Our geogrid solutions are backed by comprehensive engineering and specialized technical support. Using the latest and advanced design software applicable to a wide range of applications our team provides FREE project-specific preliminary designs to engineers and consultants all over the world. We can also provide detailed designing and working calculations including construction drawings, as well as crucial specification and installation details. Integrating our knowledge of materials, application technologies, geotechnical design techniques, and installation we have what it takes to offer effective solutions that ensure structural integrity and long-term reliability. Contact us for technical assistance with your project! Click on our brochure or on a product below for more information.